This week's Friday Strat is a day late, due to a some technical issues with the host servers. Based on a Strat originally built for SRV by the late Charlie Wirz, the above guitar is from a series of replicas produced by Rene Martinez and Charlie's Guitar Guitar Shop in Dallas, TX. Seller: raven_black62 - 100% feedback. The listing description is interesting enough to include below in it's entirety. A bit of surfing around the web confirms or at least aligns with this info. Read carefully and do your own due diligence ok! "This is a once in a lifetime opportunity to purchase and own "CHARLEY" #4 -- that's right, you did not read it wrong! Truly #4. These guitars were custom produced by Charley's Guitar Shop in Dallas, Texas. They were produced between 2002 and 2003. As you will see from the pictures, I have the original advertisement which came out of Vintage Guitar Magazine which Charley's Guitar Shop advertised in. This guitar was ordered for production in late 2001 and delivered to me in January, 2002. Originally, Charley's Guitar Shop and Rene Martinez, who as you all know, was Stevie's right hand man and consummate technician, decided to produce 100 guitars after the Santana Tour. However, Fender intervened and production was halted. Consequently, only 23 guitars were originally produced and Rene then produced another 10 totaling 33 guitars. As you will see from my back plate, it states #4 of 100. Because this guitar was produced so early, Charley's Guitar Shop had thought they would produce 100 but it never came to fruition. Hence the back plate states #4 out of 100. As more were produced after the first 10, the data on the back plate info changed. 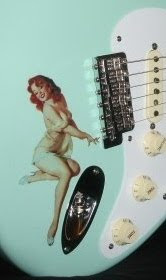 No rhyme or reason was given from Charley's other than Fender's pressure to stop production on the guitars. A damn shame! Number #1 "Charley" is owned by the producer of the Stevie Ray Vaughan box set. Santana, I believe, owns #2. Rene Martinez, I believe owns #3, I own #4, John Mayer owns #5 which you may have seen if you saw the last DVD box set "Clapton's Crossroads II". Other musicians include Kenny Wayne Sheperd, to name a few. I enclosed a picture of the original ad which viewed in late 2001 in "Vintage Guitar". When contacting Les, in charge of sales, and Rene, I questioned the stripe neck. The Guitar Shop said it was only a quick fix proto just for the ad. The "Charley Lipsticks" would be to total specs. "Flip flop" pearl white with iridescent blue tint depending on the angle of light, ebony slab, hard tail, jumbo frets, Danelectro pick-ups, wired with one tone knob and one volume control. "Charley" also comes with the snake skin case and Charley's famous SRV white guitar strap. I worked with Les, no longer with us, God love him, one of the best and Rene to have #4 put right to SRV specs. Right down to the correct position of the back decal. The only person who has ever played, set-up or tested her was Rene. "Charley" has been stored in a climate controlled setting since 2002. "Charley" has all documentation such as bill of sale, as well as other goodies Les threw in like Charley's t-shirt, ad guitar pics, key chain and other Charley's Guitar Shop advertising. Buyer will pay shipping and insurance. This is truly an ultimate must-have for the consummate Stevie Ray Vaughan fan and collector." Note: Another source indicates that the final 10 (#24 - 33) were produced by Rene Martinez and a former owner of Charlie's-- and that these last 10 do not include any Charlie's logos.